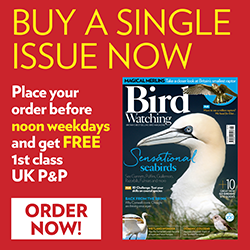 We have a fine crop of ‘summer’ bird visitors which come to the UK to breed. Most arrive during the spring, but relatively few turn up as early as March. Here are five of our early arrivers. How many of these harbingers of spring will you see? Nearly always the first of our returning hirundines, the Sand Martin chances its arm that there will be flying insects around from March onwards (often staying until October). Sand Martins are usually first seen over water (where insects emerge), and soon head off to find suitable nest sites (these being banks of sand which they can tunnel out to make their breeding colonies). Brown-and-white Sand Martins are our smallest swallows. They are easily told from House Martins by their brown colour, breast band and lack of white rump, and from Swallows by their colour and much shorter forked tail, as well as their smaller size. Since first breeding in the UK just before WWII, Little Ringed Plovers have flourished and spread, favouring gravel pits and similar rough semi-industrial inland habitats. There are now more than 1,000 pairs in the UK (mainly England and south Wales). LRPs are slimmer and more attenuated, than their chunky cousins, Ringed Plovers; with a more ‘falcon-like’ flight profile. They lack the Ringed Plover’s white wingbar and don’t have their bright orange bare parts. They do have a distinctive fine yellow eye-ring. Generally, Sandwich Terns are the first of our terns to appear in the spring (from late March). These are big, pale, front-heavy terns with black bills (yellow tipped on close inspection). One of the giveaways that Sandwich Terns are around is their loud rasping ‘kirrrick’ calls. Like most of the Sterna terns, these are predominantly coastal birds, but they will pass over the country and can turn up at inland sites in the spring. This elegant chat is a classic March bird in the UK, passing through the southern half of the country on its way north and west to the breeding grounds. These early birds are usually of the slightly smaller, paler-breasted subspecies, which includes our British breeding population. Later in the spring, larger, buff-infused Greenland-nesting birds will move through the country on their way north and west. Wheatears are particular in their habitat requirements and have an amazing ability to pick out suitable areas of very short-cropped grass (for example grazed by Rabbits or livestock), appearing on-site in the very early morning. So, good Wheatear areas often get repeat visits in subsequent years. Males have the striking pale blue back and black mask and wings. Females are browner; but both sexes have the striking white rump and black-and-white tail. Don’t listen to what tradition tells you, spring really begins the day you first hear a singing Chiffchaff. If this is not until April, then you should probably get out more! The second half of March sees the first wave of male Chiffchaffs proclaiming their new-found territories, and advertising for potential mates. The song is simple, hardly the most outstanding melody or tone, yet somehow one of the most evocative sounds of the season.